Wash and soak the sabudana in just enough water for 1 hour or so. 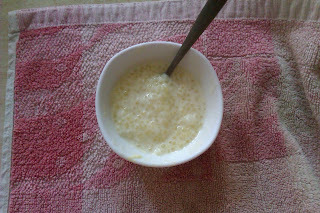 To make the kheer a little less sticky, heat ghee in a wok, add drained sabudana and mix gently. Do this for 2-3 mins. Now add enough water to cover the sabudana and cook till the pearls are transparent. Add more water if needed. Now add milk and sugar and cardamom powder (I hate the taste!). Mix well till sugar is dissolved and consistency thickens. At this stage, add the coconut milk and simmer. Continue stirring in between. Turn off the heat when kheer is of the consistency you prefer. Sabudana kheer thickens on cooling. To ensure correct consistency, add more milk if needed after taking off from stove. Else add cold milk and mix well before serving. It tastes best when cool. I am sending this to CEDD- Desserts with coconuts at Raksha's Kitchen, founded by Raven at CookEatDelicious.com.